a gorgeous litter of 9 Sheepadoodles born November 27th. Based on their 46-pound Poodle mom (Coco) and 54-pound Old English Sheepdog dad (Bentley), we expect this litter of puppies to be 45-55 pounds full grown. These Sheepadoodle puppies are very well socialized and love nothing more than to play! We believe that these Sheepadoodle puppies will make outstanding family members for a few fortunate forever homes. Astra is a beautiful black and white Sheepadoodle with a cheerful spirit. Her coat is gorgeous, soft and wavy. This very smart and beautiful girl will steal the show and the hearts of her lucky forever family! Anise is a stunning black and white Sheepadoodle who loves to have fun! This pretty lady is sweet, well-mannered and will be a wonderful furry family member! Avalon is a black and white Sheepadoodle with a heart of gold! She is an intelligent puppy who is eager to please. Avalon is an all-time people lover! She is a happy pup! Aspen’s black markings create a beautiful contrast to her snowy white undercoat. Her coat is soft and wavy. This adorable girl is easy going and is truly a wonderful Sheepadoodle puppy! Artemis is a gorgeous little girl with a loving personality. She has a super cute black markings that accent her white, wavy coat. Artemis is super smart as well, and we think that she will be very easy to train! We will miss her kisses! Asa has inky black markings that stand out against his white and wavy coat. This charmer is always cheerful. He plays politely and is always up for a cuddle! Alvin’s soft white coat is marked with black spots and has just the right amount of wave to it. This handsome boy is fun-loving and truly man's best friend! Apollo is a wonderful little puppy that loves his siblings. He has a gorgeous black and white coat and deep, intelligent eyes. He is very fun-loving and his favorite spot is wherever we are! Amos is a lovable pup with adorable black markings. Amos loves playing with his siblings, eating and snuggling with his family. 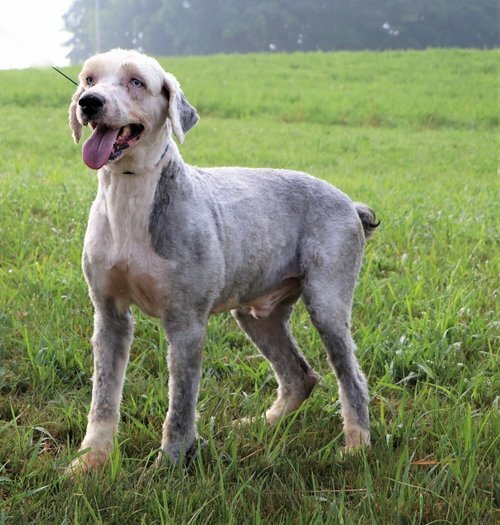 He is a smart Sheepadoodle who is sure to receive compliments for both his winsome personality and stylish looks!